Programming isn’t easy, especially if you’re not good at memorization. Depending on the language you are working with, you must recall a fair share of syntax, commands, and functions. Even if you work with code every day, it’s information that’s easy to forget. Don’t fret! That’s exactly what our cheat sheets are for. 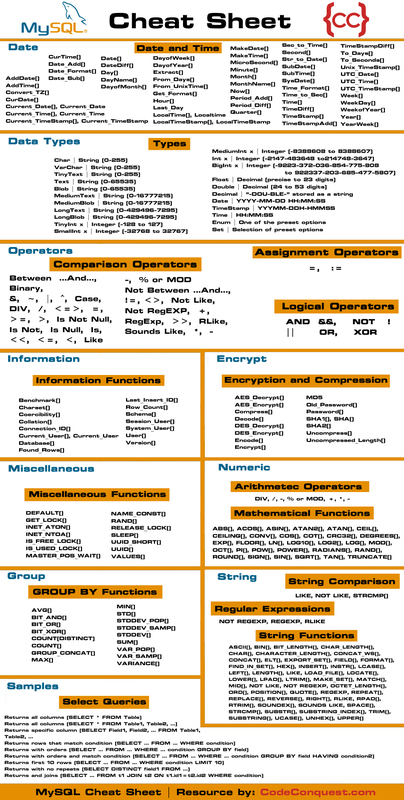 The MySQL cheat sheets we provide contain common syntaxes and data properties. They’re handy when you find yourself stuck and need help getting past an error. We offer our MySQL Cheat Sheet in two formats: standard JPEG, and PDF. Feel free to download the format that’s more convenient for you! You can also refer to this page if you want a digital version. Although this site recommends various training services, our top recommendation is Treehouse. Treehouse is an online training service that teaches web design, web development and app development with videos, quizzes and interactive coding exercises. Treehouse's mission is to bring technology education to those who can't get it, and is committed to helping its students find jobs. If you're looking to turn coding into your career, you should consider Treehouse. Disclosure of Material Connection: Some of the links in the post above are “affiliate links.” This means if you click on the link and purchase the item, I will receive an affiliate commission. Regardless, I only recommend products or services I use personally and believe will add value to my readers. Enter your email address and we'll notify you whenever we add something new to the site. Your Story Could Be Featured on CodeConquest.com! Introducing the New Treehouse TechDegree Certification Programs! Want to Switch Careers? Coding May Be the Perfect Solution!